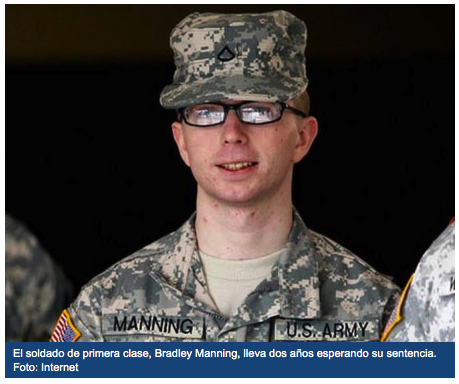 Professors blogg: El Telégrafo: "Bradley Manning case used by U.S. to put Assange on trial for espionage"
El Telégrafo: "Bradley Manning case used by U.S. to put Assange on trial for espionage"
When Julian Assange explains the risk of being extradited to the United States he always refers the case of Bradley Manning. Assange says it can go with him just as it has happened with this American soldier. Manning has been two years and two months in prison, facing 22 charges. He was arrested by the U.S. Army Criminal Investigation Command while he was serving in Iraq, accused of uploading confidential information to the Internet. Among the archives that he managed to declassify there is a video showing a U.S. Army helicopter killing a group of civilians in Iraq, including two Iraqi journalists working for Reuters -- which in turn caused worldwide outrage. Presumably, Manning is also [accused] of being responsible for the leaking of secret documents about the wars in Afghanistan and Iraq, texts Diaries christened the Afghanistan War. And of course, he is also accused of spreading thousands of diplomatic cables sent from U.S. embassies. Since May 2010, Manning was locked in a windowless cell; cut off from the outside world, and prevented of reading newspapers or receive emails; not allowed going outside to walk and forced to sleep naked every day, for seven hours, on the pretext of preventing an attempt to suicide. "Manning's trial is conducted in secret. The limited access by the press is controlled by the Military District of Washington, which means the coverage is superficial or non-existent," says Alexa O'Brien, American journalist that has followed the trial-sessions of "United States versus Manning" since December 2011. O'Brien admits that the degrading treatment that Manning received - at least during the first 10 months since he was jailed in Kuwait until he came to the military prison at Quantico - was aimed to break him down and get his confession on that he would have consciously helped Assange [Alexa O'Brien to @professors blogg: "Manning was transfered from Kuwait on July 29, 2010 and spent around 9-10 months at Quantico, where he was tortured. He was moved to Fort Leavenworth on April 20, 2011] . That would give the prosecution sufficient grounds to prosecute the founder of WikiLeaks for the crime of espionage. Currently no charges have been filed against Australian, but there is an open investigation against him. This is corroborated by one of the representatives of the General Council Human Rights Watch, Dinah PoKempner. The goal, she says, is to seek an indictment against Assange. PoKempner says that U.S. still has no incriminating evidence against Assange. "The nasty calls for “pay-back” by U.S. public figures, including some members of government, certainly give Mr Assange reasons for to be concerned, as well as the abusive treatment that Bradley Manning has received while been under military custody until this moment" said the activist. Currently, several movements have been formed to support the young soldier. One of them is "I am Manning" where one of its leading figures is Daniel Ellsberg. Back in the 70’s, he exposed the Pentagon's classified files, and won the case in court, because it was discovered the infringements of the government of Richard Nixon by illegally wiretapping conversations, in what later became known as Watergate. But what is the difference between what happened with Ellsberg and what happens with Manning and Assange? O'Brien believes that the press during the 70’s was more independent than it is now, while Billy Navarrete - of the Permanent Committee for the Defence of Human Rights (CHR) - considers that there is no difference. "States cannot hide their dirty deeds when they affect people's fundamental principles. The principle of “treason” is overcome when the action has meant the protection of human rights in all circumstances, including in armed conflicts,” said Navarrete. According to Navarrete "U.S. extended-power means that countries like Sweden does not represent guarantee for Assange’s safety. He is currently the number one enemy of the greatest world power. " Good work! Keep asking about Guardian commentary policy. That must itch in the end.